Retrofitting two twenty-year-old production machines with ABB variable speed drives (VSDs) and motors improved productivity and efficiency by reducing stoppages. In addition it enhanced the quality control of the finished product. Samuel Taylor produces precision metallic components for the aerospace and automotive industries at its plant in Redditch near Birmingham. 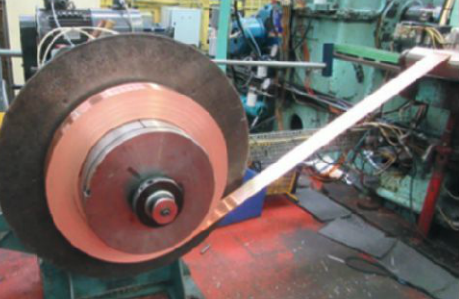 Notably, one of its product lines is for making bimetallic strips. The production line consists of several machines. These include a leveller; grooving and inlay machines; a bonder to permanently join the two strips, and a recoiler. The recoiler is under torque control and recoils the strip on leaving the bonder. The recoiler originally used a DC motor and drive that were over twenty years old. As a result of the problems experieced, the installer selected an ABB 5.5 kW AC force fan-vented motor, controlled by a 7.5 kW ACS580 ABB general purpose inverter drive. The ACS580 general purpose drive was selected as it offers many more parameters than were available with the old analogue DC drive. As a result, the commissioning engineer was able to precisely adjust and set the drive to suit the motor and application. It is important to note that the latest new ABB drives offer digitalisation of parameters and a digital display, which helped make programming much easier. The adjacent bonding machine used an 11 kW DOL motor that was prone to blowing fuses. This was chiefly caused by the high initial mechanical resistance of the adjustable compression rollers. To overcome these, a 15kW ABB General Purpose Drive was selectedral purpose drive. Finally, it demonstrated that simply by using the latest technology, it is possible to give a significan new lease of life to existing and even old equipment, providing the mechanics are sound.